The 27th edition of the NickBeer 10k took place on 10th February with 18 Denbigh harriers joining the 596 runners starting the race. 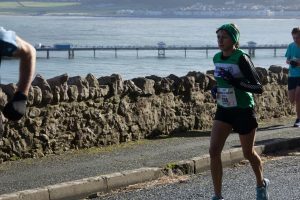 Thankfully storm Erik had subsided but the hilly course round the Great Orme in Llandudno still had some very winy conditions for the competitors to contend with. Emma Collins put in a tremendous run despite a lack of recent training and retained her category title with over 2 minutes to spare. Menai Baugh also won her category with a strong downhill part of the race. Mel Morris was second in her category and was delighted to win her second race prize in the space of a week. Katy Baugh had a welcome return to good running form finishing less than a minute in front of Mel Morris and also in front of her sister Elen Baugh on the day. Sioned Griffiths and Sali Powell were seconds apart with Sali in particular finishing strongly. Anwen Brown tried to stay with Menai Baugh but despite a strong climb could not keep up with her on the downhill section. Dawn Marshall ran strongly all the way to the finish and was happy finishing just over the hour mark. Jess Jones was running her first 10k and was a happy finisher on this tough course. The men were led home by David Baugh as he came 2nd in his category and faster than in this race last year. He was closely followed by Mat Jones running the course for the first time. Tony Benton got the better of Duncan Jones going away from him on the downhill section of the race. Fred Jones was running this race having also run it 27 years ago and the passing years have not slowed him down too much. It was good to see Gerwyn Lloyd representing the club despite a lack of training as he finished just in front of Ian Jones. It was also great to see veteran Harrier David Say finishing the race in a respectable position in his age category. 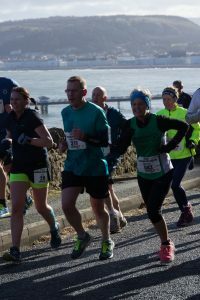 This entry was posted in 10k, Parkrun, Road running, Weekly report. Bookmark the permalink.